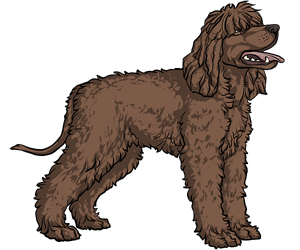 Persian manuscripts dating back to 4000 BC refer to water dogs, this does not definitely pinpoint the ancestry of the Irish Water Spaniel. It is believed that many breeds were brought over to Ireland from Spain, French, Italy and Portugal by fishermen that then bred with the local dogs. Boatswain, owned by Mr. McCarthy, is the earliest dog that has been confirmed as an IWS. He was born in 1834. The breed has webbed feet which help it to swim. It has two coats; one dense undercoat (to keep it warm) and a curly overcoat (waterproof). Every Irish Water Spaniel can be traced back to one dog, Boatswain.